If you’ve read the small backdrops post on Studio @ home, you know I am now on some R&R with wify. Of course I am packed for the ride with my photography gear. Aside from a camera I wanted to share how I pack my flash things. I got this tip from a long while ago at Strobist and here is my adaptation: The Portable Flash Pack. Just before I show how I pack for this travel let’s have a look at the stuff I am bringing with me. Motivations here are double: portability and versatility (and some other tilities as well). 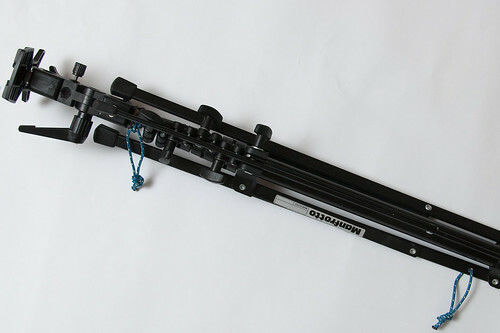 I got a 001B Manfrotto Light Stand – This is one of the lightest light stands around and it folds really small – perfect for travel. It is also tall enough to do well in most indoor situations. For outdoors, however this is not my initial choice, I’ll be using VALs (Voice Activated Lightstands) in case I need to use a flash outdoors. I also leave the umbrella adapter on the stand. I did make a small hack and drilled a hole at the “base” of one of the tripod legs. 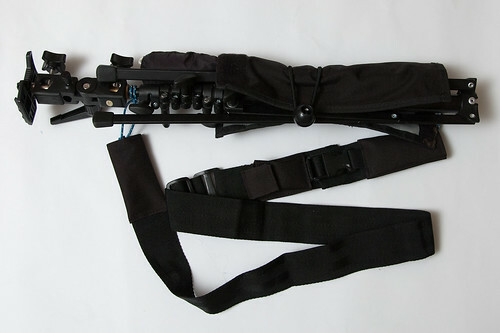 This will allow me to attach a carrying strap to the stand – more on that in just a bit. Next I have my umbrella – it is a Westcott’s convertible double-fold umbrella. 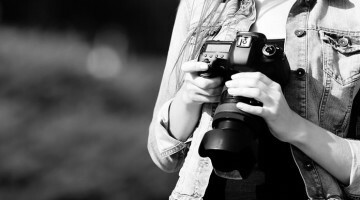 It’s no wonder that as a long time strobist this is my umbrella of choice when traveling. 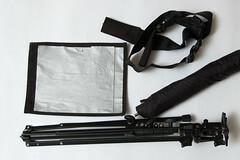 The fact that it double folds is a big ease on the pack size and for most day to day situations it is perfectly fine. I did lose the nylon cover that it comes with and did not pack the black cloth that makes earned its “convertible” name. I’m mostly using it as a shoot through. I also carry an 8″ Honl’s snoot. The snoot is coupled with a DIY speed strap. I love that snoot cuz it folds flat, it can be used as a gobo or a flash reflector. A real bargain for weight and size. For a while I was traveling with a DIY cereal snoot, but it was not as comfortable carrying as the honl one. 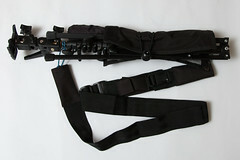 And a weapons strap to carry this thing on my shoulder. I love the weapons strap. It is wider that any regular photography strap and it has quick release latches on each end of the strap so I can quickly attach and remove the lisgtstand from it. Last I have a ball bungee band to tie it all together. It is the stand, then the umbrella. Wrap it up with the snoot. And bungee the whole thing together. I do take special attention to wrap the snoot on the opposite direction from the way I set it on the flash. This ensures that the wire inside the snoot does not bend in a “wrong” way. I also carry a camera (my faithful D70), A flash (the SB800) some gels, batteries, a charger and a set of poverty wizards. Those go in a bag. Step 1: I drilled a hole close to the base of one of the legs. 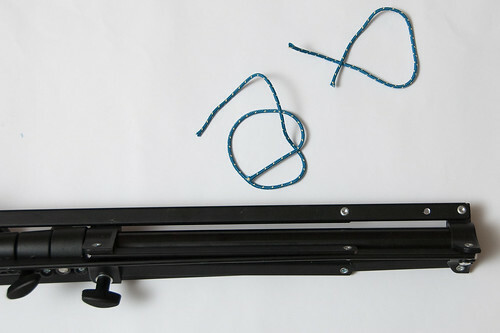 I also prepared two short ropes to make the loops that will connect the stand to the strap. 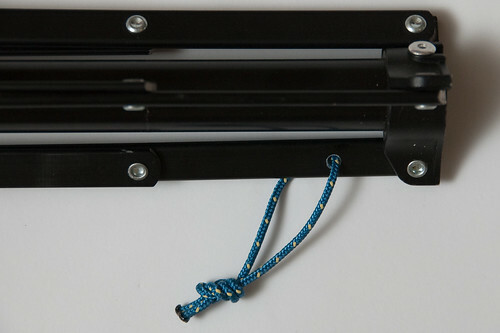 Step 2: I tied the ropes to the lightstand. One that goes through the new hole and one that goes near the end of the stand – where the flash sits. For the type of rope I am using I needed to burn the ends of the rope to keep it from going loose. The final result can be seen in the top image on this post. Now, I did get some wise advice from the wife telling me that I am going to get arrested if I am seen on the street with this Bazooka over my shoulder. I so I’ll keep you updated.